1. Meh about Merkel: Angela Merkel won a fourth term as German chancellor but with a reduced share of the vote as a far-right party made major gains. Investors aren't batting an eye. European markets were largely flat in early trading and the main German index -- the Dax -- was swinging between minor gains and losses. Asian markets mostly closed the day in negative territory. 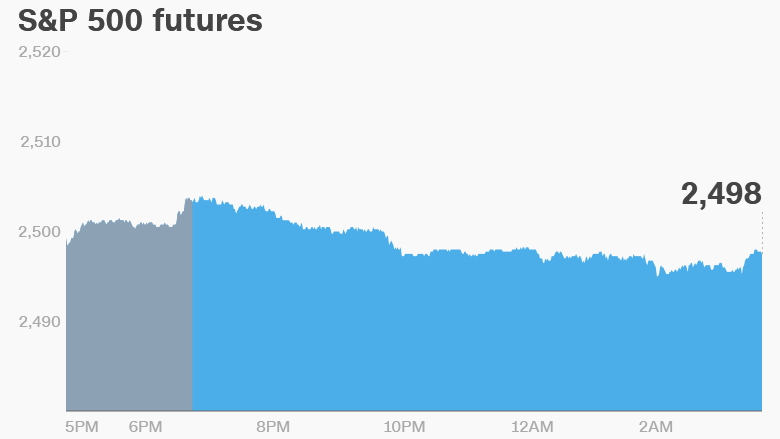 U.S. stock futures were dipping a bit, but the move down was modest. Merkel, 63, has led the European Union's largest economy for more than 11 years. She will now have to build a coalition government, probably with two minor parties -- the liberal FDP and the center-left Greens. 2. Negotiation nations: Negotiators are meeting on Monday over two important trade topics: Brexit and NAFTA. Britain and the EU are taking another stab at Brexit negotiations, after Prime Minister Theresa May tried to inject new impetus into the talks with a speech Friday. She said Britain would seek a transitional arrangement of about two years, effectively delaying the impact of Brexit until 2021. But the EU wants to see much more detail concerning the rights of millions of European migrants, and exactly how much Britain is prepared to pay in a divorce bill, before it will move on to discuss future trading arrangements. Separately, the renegotiation of NAFTA, the trade deal between the U.S., Canada and Mexico, is continuing. Little progress has been made so far on key issues, such as car manufacturing. The third round of talks began on Saturday in Ottawa and will run through Wednesday. 3. Stock surge -- Imagination Technologies: Shares in Imagination Technologies (IGNMF) were surging by about 32% in London after the tech firm said it had agreed to be acquired for £550 million ($744 million) by a Chinese-backed private equity firm called Canyon Bridge. Imagination Technologies owns and licenses intellectual property that helps power the graphics on the screens of Apple's iPhones, tablets, iPods, TVs and watches. Imagination fell on hard times earlier this year after Apple (AAPL) told the British firm it plans to stop licensing the company's technology after about two years. That news sent Imagination shares crashing by as much as 72%. However, investors aren't 100% convinced the deal will be done because Canyon Bridge's planned takeover of Lattice Semiconductors (LSCC) was blocked earlier this month by President Trump on national security concerns. The British government has said it will consider blocking foreign takeovers of critical infrastructure to protect national security.